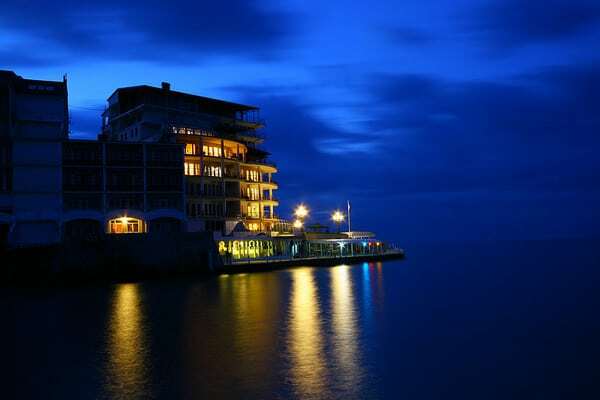 Hotel "Yacht Club" is located 10 meters from the sea and a 5-minute drive from the city center. 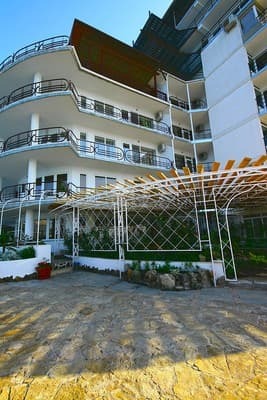 The modern hotel "Yacht Club" combines a high level of service, homeliness and unique location. There are 12 spacious rooms in the Yacht Club hotel. The rooms of the hotel are stylishly decorated, and the furniture, paintings and fresh flowers are selected with taste. Two-storey apartments, a penthouse, deluxe and standard double rooms are at guests' disposal. All rooms are equipped with individual air conditioning systems, have direct access to intercity and international telephone network. Free Wi-Fi is available. Each room at the Yacht Club Hotel has a balcony. 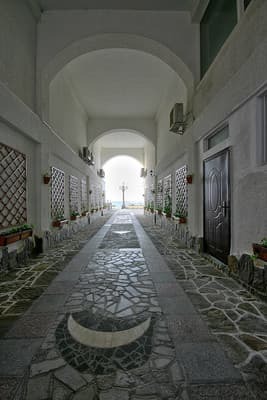 The restaurant of the Yacht Club offers dishes of Russian and Ukrainian, Eastern and European cuisine, as well as original treats typical of Mediterranean cuisine. For guests by car, there is free parking for the car. Distance from bus station Yalta - 2.5 km. PRICES MAY CHANGE, IT IS REQUIRED TO RECEIVE INFORMATION FROM THE OPERATOR. Description of the room: Double one-room with a total area of ​​45 sq.m. The width of the bed is 180 cm. 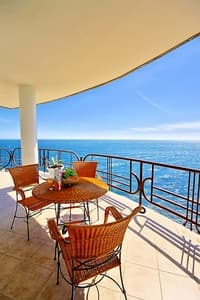 The room has a balcony overlooking the sea, the embankment of the city, the mountains. Economical room for a family of two. Convenient furnishings and soft colors will help you to feel the peace and comfort of your holiday. In room satellite TV, DVD-player and speaker system, mini-bar. There is the possibility of additional accommodation. 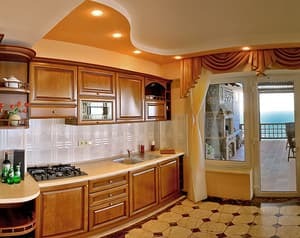 Description of the room: The total area of ​​the room is 120 sq.m. 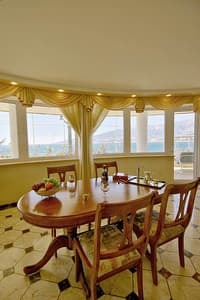 Two-room suite with private bathrooms, combines comfort and conveniences of sleeping rooms with spacious balconies with a panoramic view of the whole of Yalta. Interior, furniture, lamps, paintings, carpet are in harmony with each other and correspond to the class rooms. In room satellite TV, DVD-player and speaker system, mini-bar. There is the possibility of additional accommodation. Description of the room: Two-storey room with a total area of ​​240 sq.m. On the 1st floor there is a business lounge with a spacious hall, equipped for rest and reception of friends. The second floor houses two bedrooms with private bathrooms and a spacious balcony. 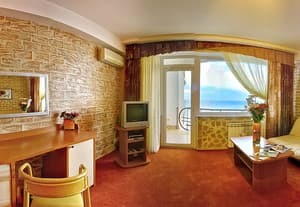 View to the sea, Yalta, mountains. One of the most modern rooms, has an individual layout and design. In room satellite TV, DVD-player and speaker system, mini-bar, modern kitchen furniture, electric stove. There is the possibility of additional accommodation. Description of the room: The bedroom and the living room are combined with a hall, the total area is 240 sq.m. The width of the bed is 180 cm. A spacious balcony with a wooden gazebo and a barbecue stretches across the square. 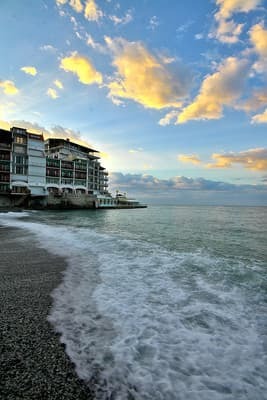 View to the sea, Yalta, mountains. A spacious room, a well thought out combination of shades. The layout of the room creates a feeling of volume, the fullness of the premises with light and air. In room satellite TV, DVD-player and speaker system, mini-bar, modern kitchen furniture, electric stove. There is the possibility of additional accommodation. The cost of extra bed is 20% of the room price. 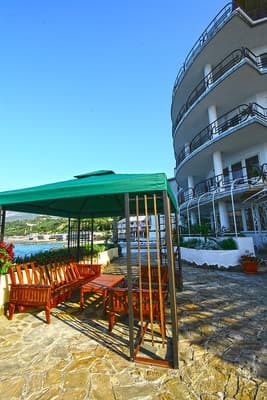 The hotel is located 5 minutes from the center of Yalta, on the first line from the sea - 10 meters from the coastline - the hotel closest to the sea Yalta! By shuttle bus number 34, stop on demand "Yacht Club."